The Spanish Institute is a highly regarded Spanish Language School specialized in teaching the Spanish language and its culture through 8 levels (3 weeks each) of Intensive Immersion program in Mexico. We Follow the European Framework of Reference for Language learning and the ACTFL guidelines. Students may attend from 1 level to all 8 levels. Our students learn from the outset to think and express themselves in Spanish as they participate in our exceptional International Award Winning Academic Curriculum and wide variety of extra curriculum activities. Our Spanish Language School has provided an intensive Spanish immersion program for over 30 years to students, professionals (from all fields) and seniors from more than 60 countries. Our functional approach to language acquisition emphasizes in using Spanish in authentic and diverse circumstances. We have a “communicative” focus, concentrating on verbal interaction in Spanish. 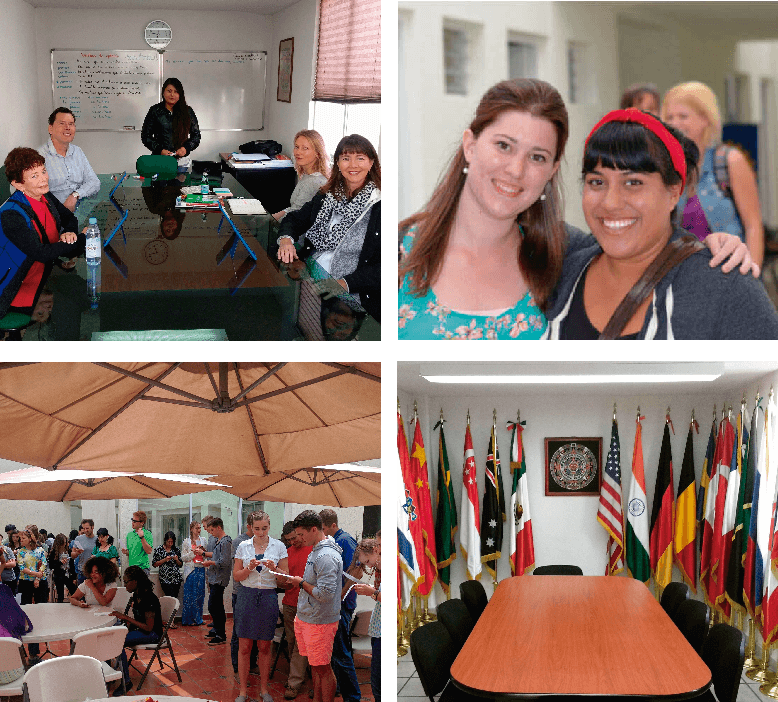 Our formal classes are dedicated to learning the structure of the language (comprehension, linguistics, reading and writing) and the conversation portion of the program to using the Spanish language – the key to really mastering it! By participating in our Spanish Immersion program you will not just learn the Spanish language… you will live the Spanish language schools. Our Students are Diplomats, Judges, Teachers, Clergy, School Administrators, Doctors, Accountants, Engineers, Journalists, Business Owners, Lawyers, Nurses, Firefighters, Police Officers, Social Workers, Pilots, Salespeople, Politicians, Retirees, Business Administrators, Flight Attendants, Scientists, People from the Entertainment Industry, Customer Service Representatives, Students, etc. from all over the world that are looking to Learn or Improve their Spanish for their Profession or personal interests. The Spanish Institute is located in an Ex-Capuchin Convent from the 17th Century that is almost 400 years old and is only 4 blocks from the Zocalo (Main Plaza) in the Historic Center of Puebla. The facade of the Institute was restored to its original look following the INAH (Instituto National de Antropología e Historia) guidelines of Mexico. The inside was remodeled with optimal classroom sizes and soundproof walls to obtain the best Spanish Language Learning experience. From the upper terrace you will have a view of the Popocatepetl Volcano and many Church steeples. The Language School is located in Puebla which is the most important Colonial City in Mexico. Due to its history and architectural styles ranging from Renaissance to Mexican Baroque, the city was named, by the UNESCO, World Heritage Site in 1987. It is a great city to learn and study Spanish due to the fact that you are living the Culture as you walk through the city. The city is famous for Cinco de Mayo, Mole Poblano, Chiles en Nogada, Architectural styles, Talavera, etc. combined with modern Industry. The city of Puebla, when compared in size, is one of the safest cities in the world. The Wall Street Journal named Puebla, Mexico as the 2nd hot destination to travel in 2018. If you are serious about learning Spanish, this is the recommended program! The desing of full immersion (classes, conversations, trips, host family) in a safe and rich-in-culture cuty like Puebla was super helpful for me. I believe that one learns more when feeling happy and I got that here with SIP. It was an excellent experience participating in the SIP program. The teacher was magnificent. After 3 weeks my Spanish in much better. The mayor benefit of attending this program was that my Spanish improved tremendously. I signed up to improve my Spanish and the morning classes were perfect for that. The small class size allowed me to ask every question I had and the teacher made the class very interactive. I now understand a lot more Spanish. I liked the optional excursions. The program at the Spanish Institute of Puebla was very organized and comprehensive. I really enjoyed having an individual conversation guide in the afternoons. My teacher was a great teacher. Started with no Spanish and can now have conversations after only 6 weeks – so it works! Live Spanish Teacher provides live language lessons over the internet, taught by our excellent Spanish native teachers. Our mission is to give you quality Spanish instruction with great convenience. You can have your Spanish lessons wherever you have access to WiFi from your computer: at home, in your office or from a hotel. Für Ihre Bequemlichkeit können Sie unsere Website auf Deutsch besuchen. For your convenience you can check our website in German. Check out some of the Activities you may do during your spare time of your Spanish studies: Volunteer Activities, Cooking and Dance classes, Extreme Sports, Cultural Activities, Watching or Participating in Sports, Shopping, Relaxing Activities, etc. Located in the heart of the Historic Center and only 1 ½ blocks from the Spanish Institute; they offer our students an excellent option of where to stay. "A Big Smile in a Small Face" was an initiative started, over 10 year ago, to give back to the Community and born out of a desire to give to some of the less fortunate children of Mexico a reason to smile. This section features, free to use, fun online games for learning Spanish . Including games, phrases , vocabulary , numbers , spelling and grammar. Spanish sayings that are old and well-known phrases or sentences that express and idea that most people believe are true. Spanish Tongue Twisters with words that are striking to the ear, designed to make your pronunciation aloud difficult to say. The Spanish speech sounds and their production, transmission and reception; and their analysis, classification, and transcription. A Spanish audio monthly article about Mexican / Latinamerican culture, festivities, traditions, history, music, food, knowledge, etc. A web site in which we explain the use and function of all the different Spanish pronouns including personal, direct, indirect, reflexive, etc. A legend is a narration of natural, supernatural facts or a mixture of both that is transmitted from generation to generation in oral or written form. If you know this list, you will know about 50% of all words used in a normal Spanish conversation. You will learn how to pronounce them, read then and write them, 20,000 Spanish words in less than 1 hour. You may listen to any of the verbs, by itself, and in a sentence; as you see the complete Spanish conjugation. A great web site that explains everything you need to know about the subjunctive. Spanish News Network - Spanish news from Mexico and around the world. Everything you need to know about Spanish Prepositions. Spanish Dictionaries, Forums, Grammar, Literature, Magazines, and more. Everything you need to know about Spanish verbs and conjugate any verb you want. About everything you need to know to be able to live in Mexico. Copyright © 1984 - | Spanish Institute of Puebla All Rights Reserved.